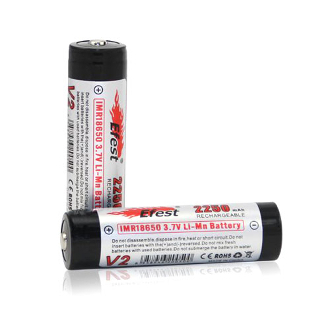 The Efest IMR 18650 High Drain 2250mAh 3.7v lithium-ion (Li-Ion) rechargeable flat top batteries have a high discharge rate and are used for MODS and other devices that accept use of 18650 Li-Ion type batteries. They are charged with any of our Efest chargers. Remember: Never leave your battery unattended while charging! ECU urges buyers to have a basic understanding and knowledge of the batteries they are using and how to handle them. ECU is in no way responsible and will not be held liable for any injury or damage or defect, caused by the improper use of lithium Ion Batteries.